When enough examples of a specific outcome about a topic or action occur, it can become understandable to generalize about it. One common example of such stereotyping in horror is the jump-scare. While exceptions of course historically exist in which this trope is utilized to a quality result, the majority (particularly in recent years, as many would attest) are over-saturated in what amounts to a shortcut. Executed at its best, a jump-scare’s function within a movie generally demonstrates how the experiences of a character can disarm or lull the audience into a false sense of security in a variety of scenarios, which in turn leads to a sudden event inciting surprise or fear. These can include a calm scenario where danger is perceived as not currently existing or having yet built up, such as with a character in everyday activity. It can be suspenseful when you’re aware danger is present or in the process of playing out and anticipate it but cannot accurately foresee what form, time, or direction from which it will come. It can even be the follow-up to an empowering moment when a character has overcome prior danger and appears victorious (Hence, the “final scare” trope). When executed too often to a sub-par result, however, a jump-scare is perceived as lazy. Such scares are usually cheap both financially in that they cost very little to do, which is unfortunately preferable from a business perspective, and creatively in that they take little-no thought or effort. For practitioners in the medium of entertainment, how you construct a jump-scare can make or break the overall reception regarding whether the fear stays with you after the momentary adrenaline high wears off or reoccurs to a similar result if absorbed again. Building up to the scene that would change sci-fi horror forever, one of the space-faring Nostromo’s crew has just had a close encounter with a being of unknown biology/origin. After a nail-biting sequence of studying and later slowly removing the hitchhiker, unraveling a couple of its secrets, waiting for the creature’s lifeless corpse to suddenly lunge, our anticipation is seemingly denied catharsis. The late John Hurt’s Kane wakes up, shaken and starving but otherwise appearing fine. The crew has dinner, chat like a relatable everyday working-class bunch, and have some laughs in a room that is by design white. 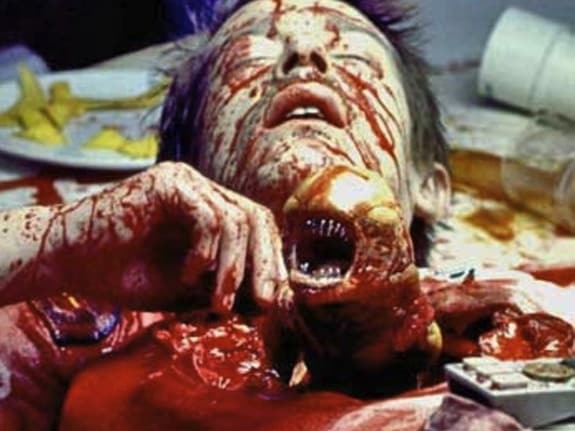 According to Ridley Scott’s Director commentary, this was specifically to contrast the torrent of gore that is about to spill (perhaps partially inspired by the contrast between blood and cleanliness in a hospital setting). That unnaturally organized, almost pristine air of such clinical environments, which we often instinctively associate with illness and suffering, creates conflict between feelings of unease and the illusion of safety. This makes the impact that much greater when our mindset of what at least attempts to present itself as a kind of “safe space” is so traumatically violated, similar to the film’s overall theme of violation beginning with the Facehugger’s assault on its victim. When Kane meets his tragic fate, we viewers have no more power to change the outcome in this moment than the crew in their efforts to help their friend. We can look away, leave, or turn it off but cannot intervene. A major reason the scare excels is because of our position as spectators, having no direct control. Let’s put aside the obvious answer that we as fans would already know what’s about to happen. Imagine a more intimate start to the survival-horror gem Alien: Isolation’s Last Survivor DLC where someone who’s never seen the films plays one of the crew present at Kane’s death, actually participating in the event from a 1st person view as the Chestbuster emerges. 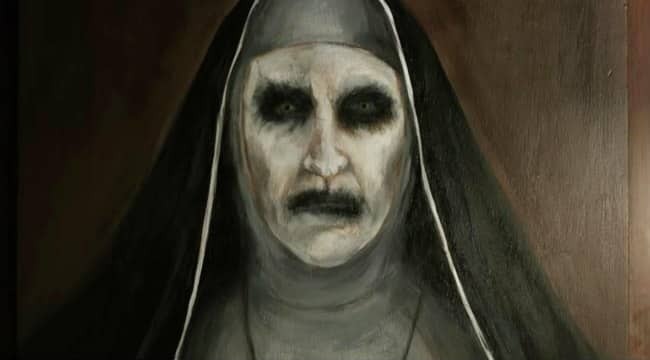 While it may certainly sound terrifying and fun in theory, this wouldn’t carry the same punch of the film for two reasons: Firstly, as said, the experience even outside context of the movie-viewer relationship is designed for us to have no power in the scenario. We’re meant to be outsiders, watching the horror play out while the crew fruitlessly try everything most of us could think of in their position with the information (or lack-there-of) they have at the time. You know the feeling you have as a child when there’s an emergency happening and your confused self can only stand by nervously as adults attempt to handle the situation? Watching this scene in a film essentially recreates that position, which is worsened as the adults prove equally helpless and confused by the threat being birthed before them. The second reason is, playing in a game that fits Alien: Isolation’s 1st person format would by default prevent us from catching every crew member’s onscreen reaction. The camera couldn’t look around at everyone’s faces in time to appreciate their expressions as in the movie, where the editing cuts to make sure every widening eye, revolted contortion of lips, anxiety of flaring nostrils, parting teeth, and jump at spurting blood is shown. Even if the game used a 3rd person pov to let you see more around you, capturing this in the same amount of detail would still be ultimately impossible. One of the fundamentals of horror is limiting the control or agency allotted to characters in any given scenario. When the interactivity of gaming is added, in which you directly control your character and thus (to an extent) the outcome that befalls him/her/it, this principle becomes twice as crucial. Part of the blueprint to fear that made Resident Evil stand out was its door opening transitions to cleverly mask loading times. A simple mechanic that would look repetitive if watched back to back enough served the added benefit of keeping a sense of dread in the player. You as Chris Redfield, Jill Valentine, Leon Kennedy, Claire, or the myriad of other protagonists may be down to your last bullet or green herb when approaching the next metaphorical gateway to another circle of Hell. Unless you’ve already been through the area, you can’t guarantee what may be waiting on the other side, making your heart skip beats with the slow creak of hinges and door knobs. Rather than emulate the original door animations as the R.E. remake did (by that time, it was more out of nostalgia than the 1996 game’s purpose for technical limitations), this provides a subtle twist that would make even the infamous dog jump-scare tip its hat in respect. Up to now, players hadn’t encountered any threat during entering or exiting an area. Most doors you transition through loaded the next level seamlessly without incident. By subverting expectations with an allegedly defeated adversary reappearing so suddenly, after having allowed you to temporarily roam with a weight off your shoulders, the fear has maximum effect by the time you’ve processed the danger you’re once again in. This is one example of attempting such a scare in film. Beverly Marsh kills her abusive father in the bathroom only to be grabbed by Pennywise upon turning to leave. The end-result onscreen is similar to Resident Evil 7 but its journey from point A to B is not. We are watching Beverly in this struggle as opposed to overcoming it ourselves in her shoes, leaving the payoff lacking. Harry Mason enters the transformed version of a locker room previously occupied by an innocent cat in one locker that spooked us earlier. Because we’ve already been jump-scared, the nightmare world has us on edge, expecting an attack from some monstrous perversion such as a demon-cat. Despite the false scare method having been used plenty in horror movies, Team Silent’s execution here instills a unique dread. Much like Resident Evil’s doors, we as Harry choose when/how to engage. You can ignore the banging for however long you please, search the room longer, take a moment to prepare yourself before opening the locker, etc. Had Director Christophe Gans sought to imitate this tactic in 2006’s Silent Hill film adaptation, viewers unfamiliar with the games may have similarly been startled by the cat, set on edge later by the nightmare-locker, and tricked before the real shock. Nonetheless, it wouldn’t carry the same dread of controlling when the scare activates. Another underlying but meaningful element is how you’re locked into a brief cut-scene of the bloody locker slowly opening when approached. When the cut-scene ends, you decide when to walk away and the number of steps you take in the programmed direction triggers the intended scare. Sometimes, it’s all in how the game plays you. As we’ve covered, jump-scares in spite of their reputation are every bit as much a legitimate craft as any mechanic in horror. The trick is in how those ingredients are taken full advantage of in different media to build up and pull off the desired effect. Share below what differences you find in how a jump-scare is cooked up through film vs. games? Do you find one superior to the other? Hello there! I am the blog writer for Horror Movie Talk. As a longtime horror and general movie fan, I thrive on feedback and encourage discussion both to get to know others' tastes and broaden my creative perspective. Having drawn & written since early childhood in addition to directing two short films in college on my road to an eventual professional career as a director and/or screenwriter, I am passionate in my opinions & ambitions on the potential of visual storytelling. Apart from that, I'm largely just another guy. When not working or volunteering at the hospital, I enjoy a good mystery novel, comics, or manga. I have multiple projects I regularly develop for my own stories, scripts, and graphic novels, including a children's book I'm in the process of publishing. My other hobbies include walking & martial arts for exercise, some video games, Youtube, Netflix, friends and family time. If you want to know more about my taste in horror films, checkout my about page. Thanks Amy, glad you liked it. Everyone loves/hates jump scares, it’s nice to have Keith break it down and give some examples. Have you been listening to the podcast? Thanks, Amy. Choosing examples to illustrate my points was initially tough, as I wasn’t sure if the picks from Resident Evil 7 and IT would explain my thoughts well. I knew from the start what I wanted to touch on but had to dig some for the right videos & steps to compare. There are certainly many to potentially reference. At one point, I almost added Exorcist III. Silent Hill was especially tricky. Ultimately, I think what I wrote was polished well for the topic. I hope you’ll enjoy the next blog! We sure do appreciate that! Let us know if there is anything you want us to cover. not be a taboo matter but usually people don’t speak about such subjects.